Adverts for some of the UK's most popular confectionery brands have been banned under rules designed to protect children from products high in fat, salt or sugar (HFSS). Online and social media ads for Cadbury eggs and Chewits and Squashies were found to have breached rules prohibiting the advertising of junk food to children by the Advertising Standards Authority (ASA). It found that the companies had failed to do enough to ensure the ads were not directed at under-16s. The ASA rules say advertisers must use targeting tools to direct ads away from users whose interests suggest they are younger than they claim, rather than just filter out users who have told social media platforms they are under 16. 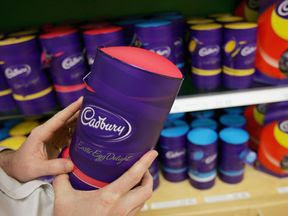 The Cadbury ban centred on adverts on its website for a storybook called The Tale Of The Great Easter Bunny, written by pop singer Frankie Bridge and featuring children hunting for Easter eggs coloured the same purple as the company's branding. A spokeswoman for Mondelez UK, trading as Cadbury, said: "We will be taking the insights and views provided by the ASA as part of this ruling and applying those learnings to our future content so we can continue to build upon our longstanding commitment to not market directly to children under the age of 16."